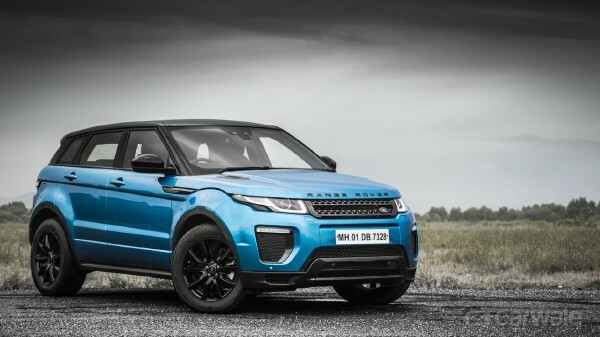 This is the Landmark edition of the 2018 Evoque. It was introduced to commemorate more than six years of the stylish SUV in the Indian market. It comes equipped with a host of updates that help distinguish itself from the standard model, which by the way, had got a mid-life refresh last year. So, what could possibly add pizzazz to an otherwise old model way past its prime, and due for a next-gen model in 2019? A bright Moraine Blue exclusive colour, may be? Sure, but there is much more to it than just a colour. The key differences come in the form of a dynamic body style kit, a carpathian grey contrast roof, body coloured lower door cladding and gloss black 18-inch wheels. What’s more, there are small but unique finishes in graphite atlas for the grille, bonnet and fender vents, and even for the ’Range Rover’ lettering. Altogether, these changes have surely pepped up the already good-looking vehicle with a distinctive design. Design-wise, there are no changes to the interior layout of this five-seater SUV. So, one still sits comfortably low in the ergonomically good cabin with supportive seats even if it’s not essentially very spacious. But it’s now decked up with grained ebony leather seats with a perforated mid-section and contrasting light grey stitching. There’s also a new dark satin brushed finish for the aluminium centre console trim that elevates the premium feel of the already luxurious interior. Conversely, the cabin still cannot be termed as a spacious one for five occupants. However, visually, the huge panoramic sunroof manages to increase the sense of space inside. And thanks to a new motorised gesture tailgate, the sufficiently large boot can now be accessed more conveniently. This brings us to the features of the Evoque Landmark Edition, which is slotted above the LE trim in Evoque’s line-up. Still, it gets some features like keyless entry from trims above. Sure, this one might miss a CD player, but then it comes equipped with a 10-inch touch screen system with JLR’s specially curated InControl app services for all your entertainment needs. If that’s not all, the carmaker is also offering WiFi hotspot and Pro Services that include enhanced navigation, infotainment and connectivity capabilities. On the safety front, ABS, airbags and ISOFIX child safety seat mounting points are some features amongst many others. These include stop/start and roll stability control, hill descent control, dynamic stability control, all-terrain progress control etc. all of which are standard.